With a warm atmosphere of Christmas and New Year we have prepared for your kids a Interactive Christmas coloring book. For coloring waits Santa Claus , reindeers , Christmas trees , baubles and lots of other Christmas decorations. The coloring book contains a number of coloring pages and additional features that your children will see with a smile on their faces. Magically appearing animated Santa Claus, stars, Christmas trees, bells, a snowman and other Christmas characters. When touched with your finger they emit joyful sounds . Kids can also place virtual stickers , giving them hundreds of ways to decorate the coloring book designs. Stickers can be Increased or decreased by double-Clicking on the image. In the background you can hear Christmas carols and Christmas songs. Kids can design Christmas cards . The child creates a card picture, saves it in the gallery, and later after pressing the share button they can send it to other people via email or post it on Facebook or any other site. The card can become a memorable holiday gift for grandma and grandpa. You can use the share functionality to print pictures as well. Coloring book is easy to use and even the youngest children are able to use it in an intuitive way. It captivates, entertains and Develops manual skills. It has many coloring pages. It teaches colors, shapes, animals and many other things. When painting you can use a brush or pencil , for less patient kids we have added a shape filling feature . Filling a shape allows you to fill designs painted by you, thanks to this kids, can create really cool pictures. Doing all the work manually, either using a brush or pencil children develop and improve manual skills. Christmas coloring book doesn't attempt to replace the traditional and very important tool, it is an accessory that complements and stimulates feelings of children. Our coloring book for children specify very good performance, while painting lines or coloring figures it has no delays. The child will be happy to use this coloring because of richness of colors, unexpected surprises and funny sounds. As a parents we always tried to find the best way to educate our kids, so combining that with our programming skills we started releasing educational games for Android (beta-tested on my own children). Christmas is right around the corner and what better way to entertain your kids than have them practice their coloring while enjoying a Christmas-themed game. They can use one of the multitude of colors available to give life to Santa Claus, his reindeer, Christmas trees or any thinkable Christmas decoration. 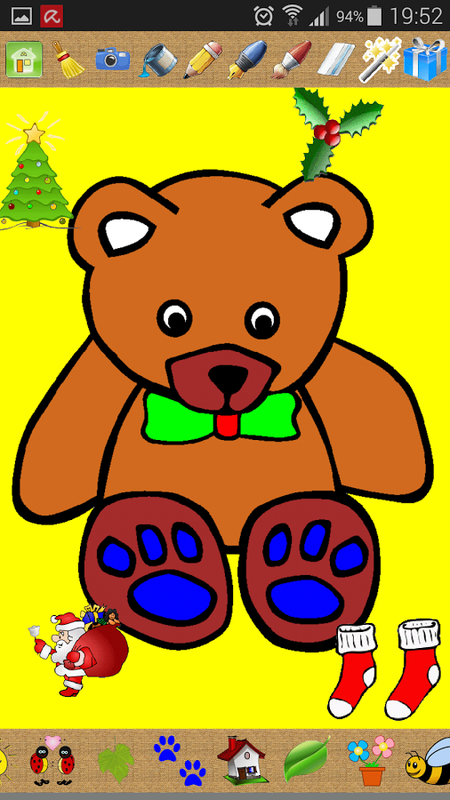 Here are some of the features in "Christmas Coloring Book" that will charm your kids: + Very easy to use, even for toddlers. They just need to pick a theme then start coloring with a brush or a pencil or even using filling shapes (for kids that are eager to complete the drawing) + Add animated cliparts. 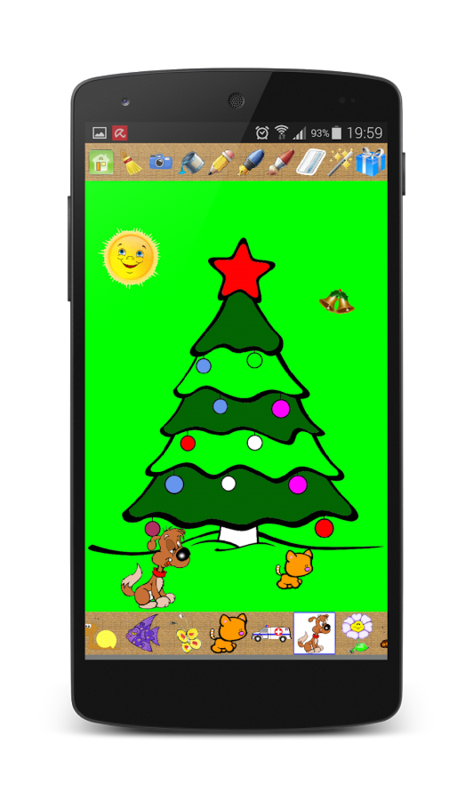 With simple drag-drop functionality they can add animations such as a dancing Santa Claus, glowing stars, Christmas trees, ringing bells that even make sounds when tapped on + Virtual stickers to decorate the coloring book they created. This basically creates hundreds of variations, and they can increase/decrease the stickers with simple taps. + Create and share Christmas postcards. It's incredibly simple to create a card picture and after that share it via mail or through social networks as a memorable gift. + Plays joyful background Christmas songs to instil even more the feeling that the winter holiday is here.